Bizarro is brought to you today by Yummy Babies. I love this gag, it's simple, dark and unexpected. I originally used this line in comedy shows by saying, "My wife and I just had a baby yesterday." (the audience invariably applauds) "Yeah, we had a baby boy, and it was really strange because we're vegan and we don't normally eat meat." (The audience is grossed out as they realize what I'm talking about.) "His mother was all, (weepy sounding)'he was such a good boy!' and we were like, 'eh, he really wasn't that good.'" I'm not saying it was a great routine and it tended to leave half the audience confused and the other half disgusted, but I enjoyed it. 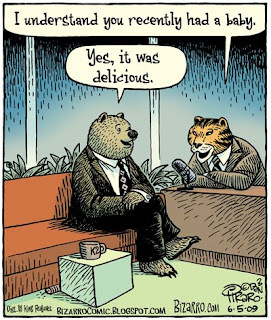 As a person who doesn't distinguis between the suffering of humans and non-human animals, it was a bit of an activist joke, too. Every animal any of us have ever eaten was terrified when it died, and mourned by those who knew him/her. Elsewhere in the news, I think Conan's residency at The Tonight Show has been good. He's got the best writers in talk show TV, for sure. A NY friend of mine who used to write for The Daily Show was hired by Conan and moved out to L.A. Now that I have an "in" at The Tonight Show, my friend assures me that I can definitely be a guest on the show. All I have to do is become a huge celebrity of some sort, preferably in TV or film. Here's a kooky idea: How about if every person who reads this blog writes to The Tonight Show and threatens suicide if they don't book me as a guest? C'mon, it would be fun! If it works, get me on the same show as Natalie Portman. I have a huge crush on her. Brilliant, gorgeous, and vegan – what's not to like? Hey Dan, I'll write. But don't expect me to look up the address. Plus, if this fails, I think we should all get together to commit suicide. You should start planning the logistics now - just in case. At least give the address you'd like us to ... well, you know. The childfree philosophy has popped up in numerous comics, and it is the reason I fell in love with you in the first place. So thank you! I'll agree to write in also, but if you get on the show, you've got to promise not to embarrass us (your devoted laughaholics) by losing control and groping Ms Portman inappropriately, or running off stage wearing LaBamba's hat or something of the sort. One last request; if you could find out where Conan keeps the masturbating bear caged and release him back into the wild. That comic (and your stand-up bit): really funny! I suggest you offer to put the Tonight Show in your comic. Synergy man, and Conan needs it.